Uganda has started withdrawing its military troops involved in the US-backed operations against Lords Resistance Army rebels from Central African Republic today. 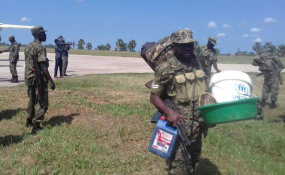 A total of 31 UPDF soldiers landed at Gulu Airfield in Gulu District on Tuesday and Wednesday in the on-going military withdraws. The 4th Infantry Division Spokesperson Lt Hassan Kato confirmed to Daily Monitor in an interview Wednesday that UPDF has began it's total withdraw from CAR. BrigadierJoseph Katsigazi, the UPDF Chief of Staff received some of the soldiers at Gulu Airfield. Uganda put its boots on the ground in CAR in 2009 after it was reported that the Lord's Resistance Army (LRA) rebels were causing instability in the densely forested western town of Obo. In 2010, the US government sent 100 of its Special Forces soldiers to support the UPDF in intelligence gathering on LRA activities in CAR. The Ugandan army has been the only active African force hunting down the rebels in the jungles, but in 2012, regional governments agreed to form a Regional Task Force (RTF) under the African Union to boost the fight against LRA. Forces from DR Congo, South Sudan and CAR were supposed to deploy under the RTF.